Enjoy a 4-hour private walking food tour and a great way to learn about Madrid´s culture and customs from the local perspective. This tour has a twist: it is a night tour, which means you´ll get to know the true life of "madrileños", since "going out" culture here makes up a big part of their daily routine. 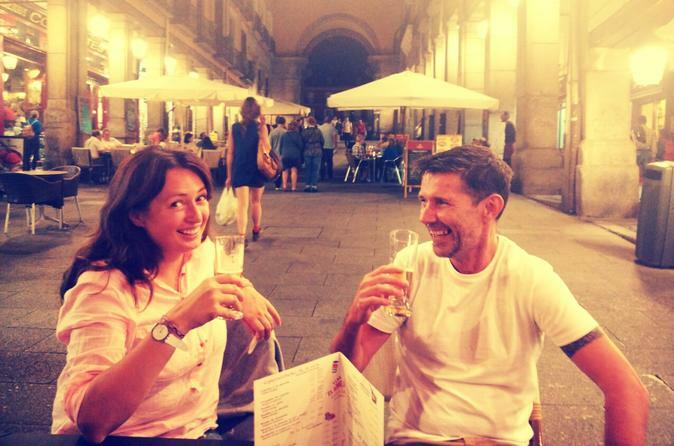 You will be surprised to learn that Madrid´s streets are often busier late at night then during a day, and that bars and taverns remain a superb and lively socializing scenes, where you can easily strike a casual conversation with a stranger. You will learn to distinguish and recognize tapas, pintxos, platos, platillos and raciones, the cultural bit of knowledge which would probably pass unobserved by the average foreign visitor in Madrid. You will see, taste and participate in the daily life of the capital, will go to traditional and lesser known places of the city, will explore different neighborhoods, will feel the contagious buzz of the night city, but most importantly you will learn about the gastronomical culture and history of Madrid and Spain and will taste culinary delights and specialties.